SQL plan management is a preventative mechanism that enables the optimizer to automatically manage execution plans, ensuring that the database uses only known or verified plans. SQL plan management uses a mechanism called a SQL plan baseline. A plan baseline is a set of accepted plans that the optimizer is allowed to use for a SQL statement. In this context, a plan includes all plan-related information (for example, SQL plan identifier, set of hints, bind values, and optimizer environment) that the optimizer needs to reproduce an execution plan. In the typical use case, the database accepts a plan into the plan baseline only after verifying that the plan performs well. This component stores relevant information about plans for a set of SQL statements. This component is the detection by the optimizer of plan changes based on stored plan history, and the use of SQL plan baselines to select appropriate plans to avoid potential performance regressions. This component is the process of adding new plans to existing SQL plan baselines, either manually or automatically. SQL plan management prevents performance regressions caused by plan changes. SQL plan capture refers to techniques for capturing and storing relevant information about plans in the SQL Management Base for a set of SQL statements. SQL plan selection is the optimizer ability to detect plan changes based on stored plan history, and the use of SQL plan baselines to select plans to avoid potential performance regressions. In general, SQL plan evolution is the process by which the optimizer verifies new plans and adds them to an existing SQL plan baseline. The SQL plan management infrastructure records the signatures of parsed statements, and both accepted and unaccepted plans. A secondary goal is to gracefully adapt to changes such as new optimizer statistics or indexes by verifying and accepting only plan changes that improve performance. SQL plan baselines cannot help when an event has caused irreversible execution plan changes, such as dropping an index. SQL plan management can improve or preserve SQL performance in database upgrades and system and data changes. Both SQL profiles and SQL plan baselines help improve the performance of SQL statements by ensuring that the optimizer uses only optimal plans. A database upgrade that installs a new optimizer version usually results in plan changes for a small percentage of SQL statements. Most plan changes result in either improvement or no performance change. However, some plan changes may cause performance regressions. SQL plan baselines significantly minimize potential regressions resulting from an upgrade. When you upgrade, the database only uses plans from the plan baseline. The database puts new plans that are not in the current baseline into a holding area, and later evaluates them to determine whether they use fewer resources than the current plan in the baseline. If the plans perform better, then the database promotes them into the baseline; otherwise, the database does not promote them. Ongoing system and data changes can affect plans for some SQL statements, potentially causing performance regressions. SQL plan baselines help minimize performance regressions and stabilize SQL performance. Deployment of new application modules introduces new SQL statements into the database. The application software may use appropriate SQL execution plans developed in a standard test configuration for the new statements. If the system configuration is significantly different from the test configuration, then the database can evolve SQL plan baselines over time to produce better performance. In general, SQL plan baselines are proactive, whereas SQL profiles are reactive. Typically, you create SQL plan baselines before significant performance problems occur. SQL plan baselines prevent the optimizer from using suboptimal plans in the future. The database creates SQL profiles when you invoke SQL Tuning Advisor, which you do typically only after a SQL statement has shown high-load symptoms. SQL profiles are primarily useful by providing the ongoing resolution of optimizer mistakes that have led to suboptimal plans. Because the SQL profile mechanism is reactive, it cannot guarantee stable performance as drastic database changes occur. Description of "Figure 28-1 SQL Plan Baselines and SQL Profiles"
SQL plan baselines reproduce a specific plan, whereas SQL profiles correct optimizer cost estimates. 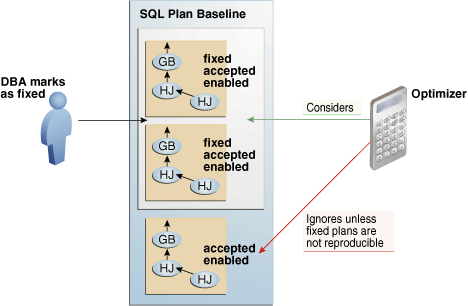 A SQL plan baseline is a set of accepted plans. Each plan is implemented using a set of outline hints that fully specify a particular plan. SQL profiles are also implemented using hints, but these hints do not specify any specific plan. Rather, the hints correct miscalculations in the optimizer estimates that lead to suboptimal plans. For example, a hint may correct the cardinality estimate of a table. Because a profile does not constrain the optimizer to any one plan, a SQL profile is more flexible than a SQL plan baseline. For example, changes in initialization parameters and optimizer statistics enable the optimizer to choose a better plan. Oracle recommends that you use SQL Tuning Advisor. In this way, you follow the recommendations made by the advisor for SQL profiles and plan baselines rather than trying to determine which mechanism is best for each SQL statement. "Analyzing SQL with SQL Tuning Advisor"
Capturing a plan means making SQL plan management aware of this plan. You can configure initial plan capture to occur automatically by setting an initialization parameter, or you can capture plans manually by using the DBMS_SPM package. When enabled, the database checks whether executed SQL statements are eligible for automatic capture. In SQL plan management, manual plan capture refers to the user-initiated bulk load of existing plans into a SQL plan baseline. You can enable automatic initial plan capture by setting OPTIMIZER_CAPTURE_SQL_PLAN_BASELINES to true (the default is false). Note that the initialization parameter OPTIMIZER_USE_SQL_PLAN_BASELINES is independent. For example, if OPTIMIZER_CAPTURE_SQL_PLAN_BASELINES is true, then the database creates initial plan baselines regardless of whether OPTIMIZER_USE_SQL_PLAN_BASELINES is true or false. To be eligible for automatic plan capture, a statement must be repeatable, and it must pass through any configured capture filters. If the database executes a repeatable SQL statement, and if this statement passes through the DBMS_SPM.CONFIGURE filters, then the database attempts to match a plan in the SQL plan baseline. The first check for eligibility is repetition. If a statement is only executed once, then the database does not consider it eligible for a SQL plan baseline. If a statement is executed twice or more, however, then it is by definition repeatable, and so the database considers it eligible for further checking. For a specified parameter, a filter either includes (enable=>TRUE) or excludes (enable=>FALSE) plans for statements with the specified values. To be eligible for capture, a repeatable statement must not be excluded by any filter. The DBMS_SPM.CONFIGURE procedure supports filters for SQL text, parsing schema name, module, and action. A null value for any parameter removes the filter. By using value=>'%' in combination with allow=FALSE, you can filter out all values for a parameter, and then create a separate filter to include only specified values. The DBA_SQL_MANAGEMENT_CONFIG view shows the current filters. "Configuring Filters for Automatic Plan Capture"
If a SQL plan baseline does not exist, then the optimizer creates a plan history and SQL plan baseline for the statement, marking the initial plan for the statement as accepted and adding it to the SQL plan baseline. If this plan does not match a plan in the SQL plan baseline, then the optimizer marks the new plan as unaccepted and adds it to the SQL plan baseline. If this plan does match a plan in the SQL plan baseline, then nothing is added to the SQL plan baseline. 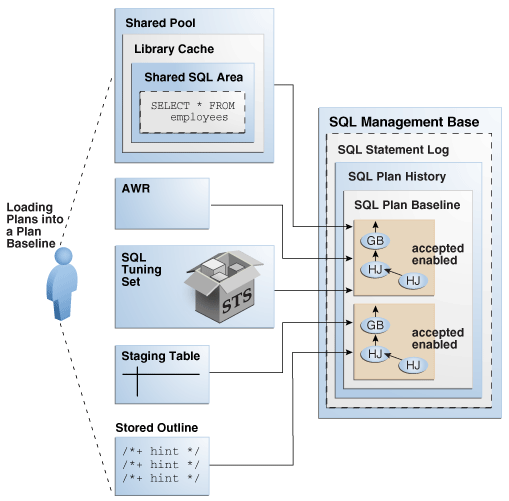 Use Cloud Control or PL/SQL to load the execution plans for SQL statements from AWR, a SQL tuning set (STS), the shared SQL area, a staging table, or a stored outline. Description of "Figure 28-2 Loading Plans into a SQL Plan Baseline"
Manually loaded plans are always marked accepted because the optimizer assumes that any plan loaded manually by the administrator has acceptable performance. You can load plans without enabling them by setting the enabled parameter to NO in the DBMS_SPM.LOAD_PLANS_FROM_% functions. When the database performs a hard parse of a SQL statement, the optimizer generates a best-cost plan. By default, the optimizer then attempts to find a matching plan in the SQL plan baseline for the statement. If no plan baseline exists, then the database runs the statement with the best-cost plan. If the new plan is in the baseline, then the database executes the statement using the found plan. If fixed plans exist in the plan baseline, then the optimizer uses the fixed plan with the lowest cost. If no fixed plans exist in the plan baseline, then the optimizer uses the baseline plan with the lowest cost. If no reproducible plans exist in the plan baseline, which could happen if every plan in the baseline referred to a dropped index, then the optimizer uses the newly generated cost-based plan. 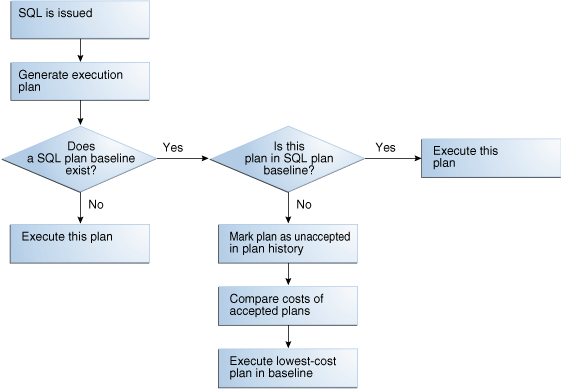 Description of "Figure 28-3 Decision Tree for SQL Plan Selection"
In the standard case of plan evolution, the optimizer performs the preceding steps sequentially, so that a new plan is not usable by SQL plan management until the optimizer verifies plan performance relative to the SQL plan baseline. However, you can configure SQL plan management to perform one step without performing the other. The following graphic shows the possible paths for plan evolution. Description of "Figure 28-4 Plan Evolution"
Typically, a SQL plan baseline for a statement starts with one accepted plan. The DBMS_SPM package provides procedures and functions for plan evolution. However, some SQL statements perform well when executed with different plans under different conditions. For example, a SQL statement with bind variables whose values result in different selectivities may have several optimal plans. Creating a materialized view or an index or repartitioning a table may make current plans more expensive than other plans. If new plans were never added to SQL plan baselines, then the performance of some SQL statements might degrade. Thus, it is sometimes necessary to evolve newly accepted plans into SQL plan baselines. Plan evolution prevents performance regressions by verifying the performance of a new plan before including it in a SQL plan baseline. These subprograms use the task infrastructure. For example, CREATE_EVOLVE_TASK creates an evolution task, whereas EXECUTE_EVOLVE_TASK executes it. All task evolution subprograms have the string EVOLVE_TASK in the name. "Evolving SQL Plan Baselines Manually"
The SQL management base (SMB) is a logical repository in the data dictionary. When automatic SQL plan capture is enabled, the SQL statement log contains the signature of statements that the optimizer has evaluated over time. The SQL plan history is the set of captured SQL execution plans. The history contains both SQL plan baselines and unaccepted plans. The SMB stores information that the optimizer can use to maintain or improve SQL performance. 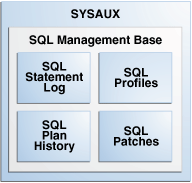 The SMB resides in the SYSAUX tablespace and uses automatic segment-space management. Because the SMB is located entirely within the SYSAUX tablespace, the database does not use SQL plan management and SQL tuning features when this tablespace is unavailable. Description of "Figure 28-5 SMB Architecture"
Data visibility and privilege requirements may differ when using the SMB with pluggable databases. See Oracle Database Administrator’s Guide for a table that summarizes how manageability features work in a container database (CDB). A SQL signature is a numeric hash value computed using a SQL statement text that has been normalized for case insensitivity and white space. When the optimizer parses a statement, it creates signature. During automatic capture, the database matches this signature against the SQL statement log (SQLLOG$) to determine whether the signature has been observed before. If it has not, then the database adds the signature to the log. If the signature is already in the log, then the database has confirmation that the statement is a repeatable SQL statement. If a filter excludes a statement, then its signature is also excluded from the log. This example illustrates how the database tracks statements in the statement log and creates baselines automatically for repeatable statements. An initial query of the statement log shows no tracked SQL statements. After a query of hr.jobs for AD_PRES, the log shows one tracked statement. The session executes the query for job_id='PR_REP' a second time. Because this statement is now repeatable, and because automatic SQL plan capture is enabled, the database creates a plan baseline for this statement. The query for job_id='AD_PRES' has only been executed once, so no plan baseline exists for it. In SQL plan management, the database detects new SQL execution plans for existing SQL plan baselines and records the new plan in the history so that they can be evolved (verified). Evolution is initiated automatically by the database or manually by the DBA. Starting in Oracle Database 12c, the SMB stores the execution plans for all SQL statements in the SQL plan history. The DBMS_XPLAN.DISPLAY_SQL_PLAN_BASELINE function fetches and displays the plan from the SMB. For plans created before Oracle Database 12c, the function must compile the SQL statement and generate the plan because the SMB does not store it. An enabled plan is a plan that is eligible for use by the optimizer. An accepted plan is a plan that is in a SQL plan baseline for a SQL statement and thus available for use by the optimizer. An accepted plan contains a set of hints, a plan hash value, and other plan-related information. A fixed plan is an accepted plan that is marked as preferred, so that the optimizer considers only the fixed plans in the baseline. Fixed plans influence the plan selection process of the optimizer. "Displaying Plans in a SQL Plan Baseline"
When plans are loaded with the enabled parameter set to YES (default), the database automatically marks the resulting SQL plan baselines as enabled, even if they are unaccepted. You can manually change an enabled plan to a disabled plan, which means the optimizer can no longer use the plan even if it is accepted. The SQL plan history for a statement contains all plans, both accepted and unaccepted. After the optimizer generates the first accepted plan in a plan baseline, every subsequent unaccepted plan is added to the plan history, awaiting verification, but is not in the SQL plan baseline. Assume that three plans exist in the SQL plan baseline for a statement. You want the optimizer to give preferential treatment to only two of the plans. As shown in the following figure, you mark these two plans as fixed so that the optimizer uses only the best plan from these two, ignoring the other plans. Description of "Figure 28-6 Fixed Plans"
If new plans are added to a baseline that contains at least one enabled fixed plan, then the optimizer cannot use the new plans until you manually declare them as fixed.